Cardbox Software Limited, the company which sold Cardbox and maintained its web site, is now closed. Cardbox itself, the program, continues to work. It is still free to download and to use. Your Remote Desktop software will connect to your new Windows computer. (If you get a message saying “The server name on the certificate is incorrect: do you want to connect to this computer anyway?”, press the button saying “Yes” or “Connect”). In a few seconds you will see your new Windows desktop. On your desktop, you’ll see a Cardbox icon. Double-click on it. The chances are that you’ll be using a lot of password-protected databases, and some of them may be protected with encryption keys as well. To save the boredom of having to type your credentials in the whole time, you can make Cardbox remember them for you. In Cardbox, do File > Workspace. Go to the Password tab. Turn on “Enable password protection” and enter a new password. Write it down somewhere, as a backup. Turn on “Make WIndows remember the password in future”. We have tried two apps for connecting to Windows computers via Remote Desktop. Both of them work. One is free, and the other costs money. The free app is AccessToGo. It claims to work on the iPhone as well but we have not tested this. The paid app is iTeleport. It costs £13.99. A first impression is that it is quite feature-rich and complex. By now, you have created your Windows computer in the cloud, started it up for the first time, and found out its IP address. 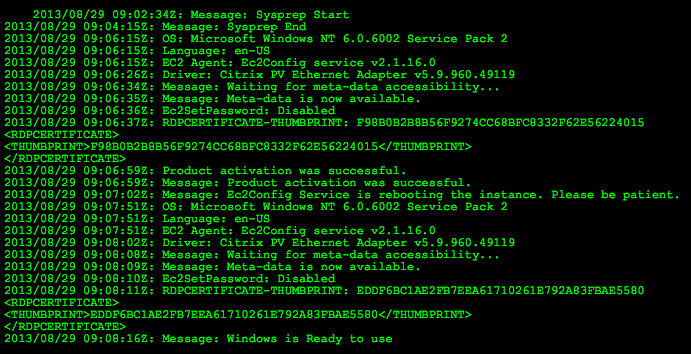 You have got yourself software for connecting to Windows computers via Remote Desktop, and you have started it. Now you have to set up passwords. This is the last bit of system administration you will have to do. Press the Start button, click on “Control Panel” on the right of the box, double-click on User Accounts. Think of a new password for the Administrator user and write it down. Then pick “Change your password” from the User Accounts window, and enter your new password. Click on “Manage other accounts”. Delete the user called Admin (and say Yes to deleting its files). Admin is not needed. Finally, go to the Client account and change its password. The Client account is the one you will use on a day-to-day basis when using Cardbox from your iPad or Mac. You may never need to use the Administrator account again. And that is that. You can now log out as the administrator (press the Start button and then select Log Off from the menu at the far bottom right-hand corner). You are now ready to log in as Client, and to use Cardbox. Throughout this series I’ve been talking as if you are the only one to be using this computer to run Cardbox and access your Cardbox Server databases. But you may very well not be. Your work colleagues may want to do the same. In that case you will want to give each of them his own account. To add a new user, you have to be the administrator. The same Start > Control Panel > User Accounts process you used to change passwords can also be used to add new users. Make sure you give each user a password. 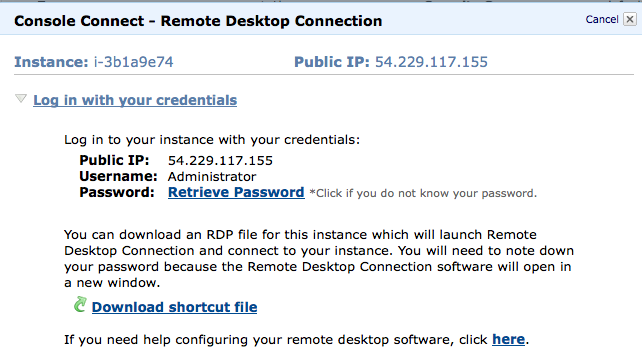 There is one more thing: the users you add must be made part of the Remote Desktop Users group. The command to do this is Start-Administrative Tools-Computer Management-Local Users and Groups-Groups-Remote Desktop Users. Press the Add button, type the user names, click on “Check Names” to check them, and then press OK. If you have not already done so, go to aws.amazon.com/console to sign in to the Amazon Web Services management console. In the list of available services, click on “EC2”. Press the Continue button at the bottom right-hand corner of the wizard. In the Instance Details page, the default settings apply: you can check that the number of instances is 1 and the instance type is ‘t1.micro’. Press Continue. In the Advanced Instance Options page, the default settings apply. Press Continue. In the Storage Device Configuration page, the default settings apply. Press Continue. In the “Add tags” page, nothing needs to be done. Press Continue. In the Key Pairs page, select “Proceed without a Key Pair” (the password for this computer is fixed, and you will change it later). Press Continue. In the Security Groups page, select “Create a new Security Group”. Give it the name “Remote Desktop”, and in Inbound Rules, create a new rule by picking “RDP” from the drop-down list (it is at the very bottom of the list, so you may have to scroll). Your screen should look like the picture below. Press Continue. (Security Groups are effectively a firewall between your computer and the Internet). The final page of the wizard summarises all the information you have entered or confirmed. Finally, press the Launch button to start your new computer. Now read Starting the Computer for the First Time. To sign up to Amazon Web Services, go to aws.amazon.com/console and press the Sign Up button at the top of the page. The screens that follow take you through the process of creating an account, entering your payment details, and entering a telephone number which Amazon will verify. When you are asked to “Select Your AWS Support Plan”, select the free option. Once the sign-up process is complete, select the link that says “Launch the AWS Management Console”, and press the “Sign in to the AWS Console” button on the next page. None of this costs you anything. Costs only start when you create your server. Suppose you have a Cardbox Server which contains your databases. When you are away from the office, you usually connect to your Cardbox Server by running Cardbox on your laptop. But now you have an iPad – or you switch to Mac OS – so what do you do? You have a Windows computer in the cloud, running Cardbox and Remote Desktop. On your iPad or Mac, you connect to that computer, and you see the normal Windows desktop with Cardbox running on it. The cloud computer: if you use Amazon, it costs $29 per month if you run it continuously. If you leave it shut down most of the time and only start it up when you know you are going to need it, it costs $3 per month plus $0.035 (3.5 cents) for each hour that you are running it. There will be an additional cost for data transmission, but we expect it to be very small. The connecting software: costs nothing. Signing up to Amazon Web Services. Creating your computer in the cloud. Starting the computer for the first time. Connecting to the computer from the iPad and from the Mac. Shutting the computer down and starting it up.